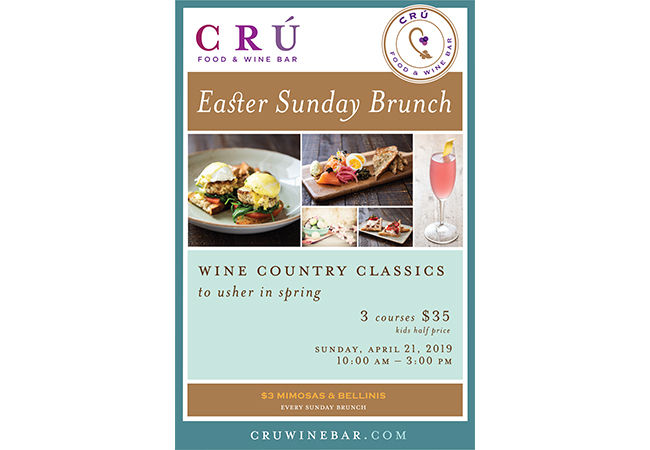 CRÚ is now taking reservations for their annual Napa-style Easter Brunch. CRU's Easter menu is featuring a few sneak peek items from their new Brunch Menu. Bring your family and friends where they can choose from a mouthwatering array of fabulous brunch items to build their own 3 courses of deliciousness. With so many choices, everyone gets to pick their favorites and be happy and full. Extra bonus: they serve $3 mimosas, bellinis, ciprianis and it will be Swirl Sunday so enjoy 1/3 off all bottles of wine! Don’t risk long lines or restaurants that don't take reservations; call CRÚ today! Kids 12 and under eat for half off. Please access the high resolution beautiful pictures and menu in the links below.